In a surprise release on Tuesday, Apple debuted the Smart Battery Case for iPhone 6s and 6, the first integrated battery pack to come out of Cupertino since the original iPhone launched in 2007. According to the item's description, the Smart Battery Case is designed specifically for iPhone 6s and iPhone 6 devices, offering users a high level of protection and up to 25 hours of extended usage. Like Apple's current lineup of custom-fit iPhone cases, the battery-packed version is made from soft touch silicone and comes lined with microfiber material. A special elastomer hinge design allows for easy insertion and removal, suggesting the case itself is somewhat pliable. A small "chin" section houses the Lightning connector and what appears to be acoustic channels for iPhone's speaker and microphone. Importantly, a female Lightning port is built in to the case bottom, meaning iPhone owners connect their favorite Lightning accessories or charge iPhone and the Smart Battery Case simultaneously. Apple points out compatibility with the official Lightning dock. 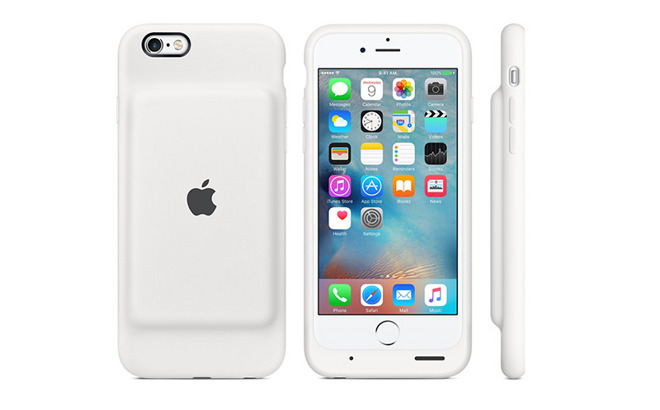 Unlike popular third-party designs that effectively double iPhone's sleek profile, like Mophie's Juice Pack, Apple chose to stuff the external battery into a small hump. Cutouts along the edges and case back provide access to iPhone's iSight camera, mute switch and headphone jack, while system volume controls and sleep/wake button remain snugly covered. Apple fails to specify exact battery capacity information, but claims talk times can increase up to 25 hours, Internet browsing over LTE up to 18 hours, and audio and video playback up to 20 hours. When attached and charging iPhone, users can quickly check the pack's power status through a special lock screen graphic and in Notification Center's Batteries section. German language site iPhone-ticker.de also reported on Apple's Smart Battery Case launch. The Smart Battery Case comes in at $99 and is being offered in white and charcoal gray colors. Orders are being accepted now through Apple's website with overnight delivery times pegged at Dec. 10 to Dec. 14, or Dec. 11 to Dec. 15 for the free option.